Established in the year 2009, Karni Engineering Works (India) is one of the leading company’s engaged in manufacturing of Papad Making Machine, Chapati Making Machine, Snacks Making Machine, Dough Making Machine and much more. We are committed to fabricate the best quality and cost-effective machines in the market with technical expertise and immense knowledge. In order to achieve high standards in our products, we have developed a streamlined quality management system in our entire business operation. Mr. Karan Falodia carries out supervision work in an excellent manner. Because of him, we have been able to achieve our goals and stand ahead of our industrial counterparts. He keeps control over the financial accounts and maintains a balance between various financial transactions. 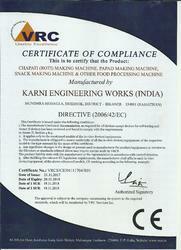 Karni Engineering Works is involved in manufacturing advance solutions for making chapati and snacks. As a manufacturer and supplier, we entered the industry in the year 2009 and have carved a strong domain position since then. Based at Rajasthan (India), we are serving to our clients all around the country with our range of Food Processing Machines. Our offered line of products encompasses Papad Making Machine, Chapati Making Machine, Snacks Making Machine, Dough Making Machine and much more. Widely used for making chapati and snacks like papad, mathi, etc. Our range of machines is hugely appreciated for their useful attributes. Easy to install and operate, our engineering solutions are most suited for household and commercial kitchens in restaurants, hotels, industrial canteens, hospitals, institutions etc. Manufactured by using high-end technology based machines and equipment, we keep up with technical specifications and fulfil the requirements of our clients in the food industry. We use premium quality components in the manufacturing process to reach excellence parameters and earn the trust of our valuable clients. Appreciated for robust construction, hygienic processing, safe and easy operation, customer-friendly usage, easy to clean and maintain. Our offered machines have a huge demand in nationwide market. Moreover, working under the direction of our industrial experts, we achieve domain excellence that further leads us to our business growth. We have constantly been focusing on all standards of quality that makes us preferred choice amongst others. Following factors set us apart from other manufacturers in the industry. Our team members are the backbone of the organization and thus, we share the credit of success with them. We are working with pool of veteran experts. Our team has Supervisors, Procuring agents, Production Managers, Quality Inspectors, Warehousing Employees, Sales and Marketing Executives and Skilled & Semi-Skilled Workers. 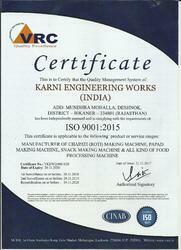 Our Company is ISO 9001:2015. 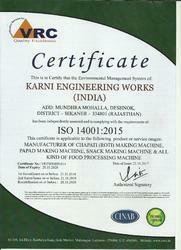 Our Company is ISO 14001:2015 (Environmental Management System) certified. Our company is equipped with an advanced manufacturing facility to obtain all business operations in a streamlined manner. It is per-loaded with latest machines and is segmented properly into varied departments. To maintain a streamlined processing within the set-up, we have team of specialized and hardworking professionals. We regularly upgrade our facility to stay tune with the current market trends.